Provide comfort for the family of Esther Castagne with a meaningful gesture of sympathy. 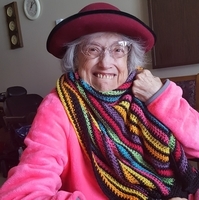 Esther Muriel Bentley Castagne, who was generous, spunky, cultural, vivacious, authentic; who also enjoyed adventure and traveling, and who was devoted to her beloved husband, Joe, passed away peacefully on March 26, 2019. She was born October 15, 1929 to Glossie and Mabel (Carey) Bentley in Brattleboro, Vermont. She was adventurous and mischievous as a kid, especially with her cousin Clara. Esther grew up in Hinsdale, New Hampshire and Northfield, Massachusetts, where she attended the Northfield School for Girls. Esther was full of fun stories of her years at The University of Vermont (UVM), where she graduated on June 14, 1953. She was totally dedicated to being educated and helping others to become educated. She was taking classes in her 60s at Rocky Mountain College in Billings, Montana to expand her own education. A few years after graduating from UVM, she ventured out to the West to visit a friend and met and fell in love with her future husband. Her beloved “Joe Castagne” used to say her “long legs caught my eye”. 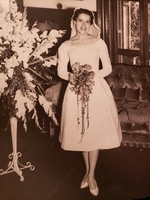 Joe and Esther married on September 9, 1961 in Northfield, Massachusetts and settled in Red Lodge, Montana, where the Castagne brothers operated the Montana Meat Market. Esther always overcame all obstacles with her playful loud laughter and by giving extra hugs. It was always surprising how long it took when walking down the streets of Red Lodge, Montana, being stopped so many times for conversations, hugs and laughter. One could see her a mile away since she loved to wear vibrant-colored clothing, and her bright color high top converse shoes. Her curly hair and bright lipstick were the staples to her style. Joe and Esther loved black Labradors. Their “Pops” meant the world to them. Joe loved to cook and Esther just adored his cooking. Joe and Esther were so proud of their remodeled kitchen in the 1980s so they could have their internationally-sponsored and -supported students from Turkey and El Salvador over for meals. Joe could create bigger dinner parties for Emine (a.k.a Sebnem), Didem, Suavi and Norma, who brought so much delight and adventure into Esther’s life. Esther travelled to El Salvador; an East Coast trip with Emine featuring a Washington D.C to Vermont drive by car to trace her East Coast childhood memories; San Francisco, and more. She came to New York City just to be at Emine’s graduation, since no one else could attend. Esther became a “second mother” to her international “children”, offered a second home and a safe harbor to those far away from home, with no expectations in return. Her international “kids” said her playful, loud laugh would embarrass them in restaurants. Her laugh will be so missed. After Joe passed, Esther was in Tender Nest Assisted Living, then Cedar Wood Villa for 13 years. She was loved as well as sometimes a trouble maker. She was determined in getting what she wanted and her shenanigans always ended with her laughter with the staff and her friends. She leaves behind her nephews Robert Bentley of Fairfax, VA, and Gary Bentley of Middlebury, CT; nieces Diane Lambert of West Simsbury, CT, and Ellen Berez, of Monroe, CT; sister-in-law Lila Bentley of Southbury, CT; and several cousins including Carolyn Willis, Connie Rutter, James Willis, Sara Lee Powell, and Laura Farrioe, She also leaves behind her international “kids”, Norma Mayer from El Salvador, her “Turkeys” as she called Sebnem Oden (her “first born, Emine”), Didem Oden Park, and Suavi Oden. Esther was predeceased by her parents, and older brothers, Roland and Ralph. Her ashes will be placed with her beloved Joe in Red Lodge, Montana, and with her parents and her eldest brother, Roland, in Sandgate, Vermont. A celebration of Esther’s life will be at Cedar Wood Villa located at One South Oakes Avenue, Red Lodge, Montana on April 6, 2019 at 1:30 p.m.
To send flowers to the family of Esther Muriel Castagne, please visit our Heartfelt Sympathies Store. To plant a memorial tree in honor of Esther Murial Castagne (Bentley), please visit our Heartfelt Sympathies Store.